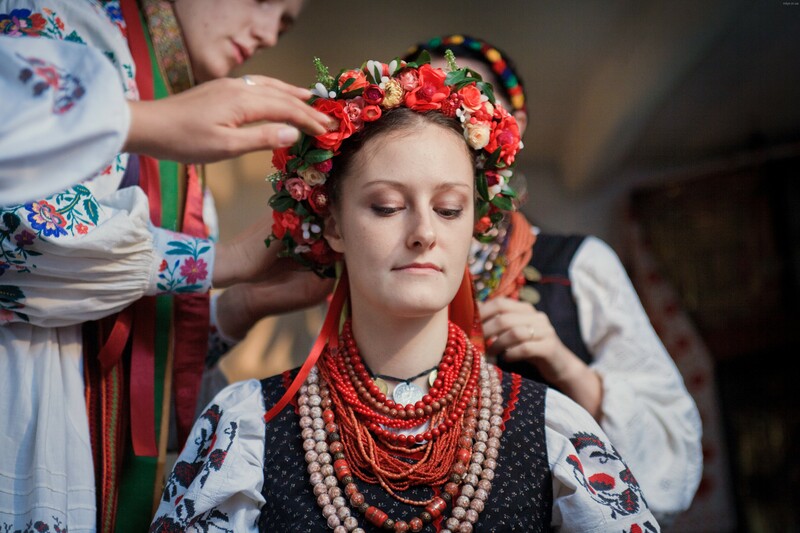 History of Ukrainian costume is inseparable from traditions that existed back in the times of Kyiv Rus. We can find a proof of that in the legendary Tale of Igors Campaign where such elements of an outfit as svytka, kozhukh and sharovary are mentioned numerously. Main element of Ukrainian national costume, sorochka (national shirt) has traveled through time since then and in centuries to follow. 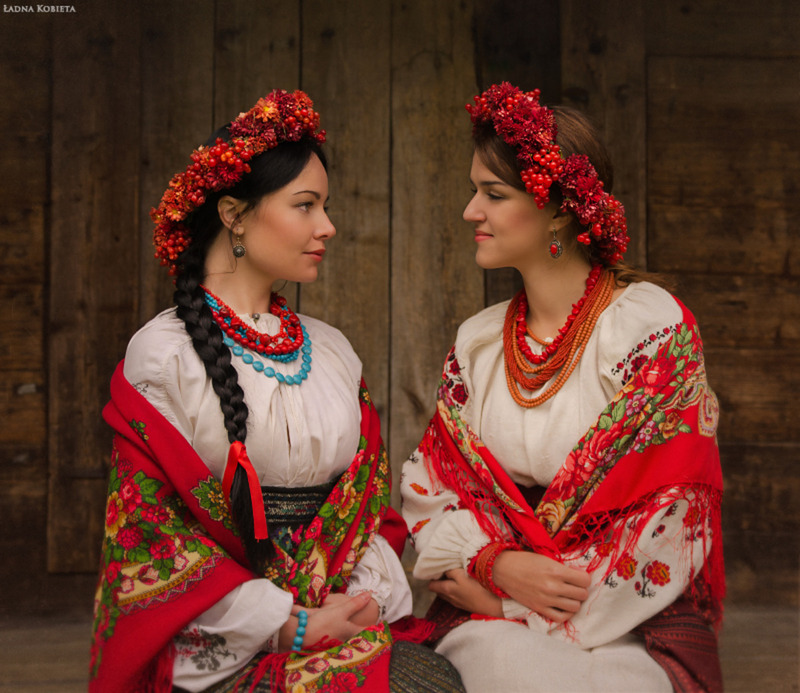 Since olden times work on a national outfit has been a sacred process that reflected our craftswomens urge to pass on traditions and transfer to a cloth picturesque nature of Ukraine standing in drastic contrast to sad historic events that life of people had been full of for centuries. Headwear was an important part of a womans wardrobe, it could tell a lot about its owner. For instance, single ladies preferred tender wreaths decorated with flowers or bright ribbons, married ones opted for ochipok (a piece in a shape of a skullcap with a vertical section in the back, that was to be laced) to cover hair. Women took them off only before going to bed. Ochipok was made of all kinds of materials such as textile, silk and brocade. Use of expensive materials is explained by the fact that ochipok was popular in all layers of society. On top of ochipok festive namitka was worn (a piece of white fabric 1 to 5 meters long that was wound around the head in various ways). Walking without a headdress wasnt welcomed  there was a belief that it could bring all sorts of misfortunes such as crop failure or epidemic sickness of livestock. As to footwear, in warm seasons Ukrainian women wore ankle-boots on small heels and in winter  leather boots with ornamentation. Main distinctive of Ukrainian national costume is that, given common idea of an outfit, nearly each region created own unique version. Differences began with patterns and color of embroidery and ended with certain discrepancies in key elements. For instance a hutsul could be easily spotted by kresanya  black felt hat decorated with a buckle and with a feather sticking from beneath it. Dwellers of highland regions really liked wearing a keptar  sleeveless jacket made of fur that helped get warm and protected from winds in the mountains. There was also leybyk  another sleeveless jacket, only made of cloths  this one caught fancy of inhabitants of the northern part of the country. And dwellers of western regions were remarkable because of their footwear  postoly, made of a single piece of leather and worn on top of onuchi. Traditional outfits of many countries failed to naturally blend in to a new century. They are revered, used during all kinds of national holidays but they are rarely if ever worn in everyday lives. But its not the case of Ukraine  we cannot imagine our lives without certain elements of wardrobe such as shirts and dresses decorated with traditional ornamentation, male hats and warm sheepskin coats. And such affection is justified because they resonate with clothes of our predecessors - this doesn't let national outfits become a thing of past but promises them a long future instead.